Our promotional dice are custom printed with the design and copy of your choice. You can choose from Custom Casino Dice which look like the dice used in Las Vegas and Atlantic City, Translucent Red Casino Style Dice, Opaque Store Dice, Value Line Dice, and Loaded Hardwood Dice, each imprinted with your design. These Custom Casino-Style Dice feature standard flush spots like you'll find in casinos. 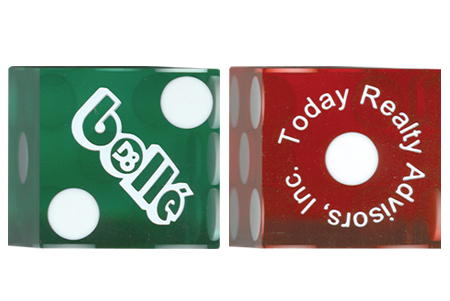 Red and Green Custom Casino-Style Dice are available. These dice feature a high-polish finish with square, "razor" edges. The minimum order is 100 pair. Our 3/4" Value Line Custom Dice feature your one- to full-color custom design on the one side and standard spots on sides 2-6! You can print a photo, words, a logo, or any design you have in mind. Choose from black, blue, green and red Value Line Dice with white spots and white dice with black spots. 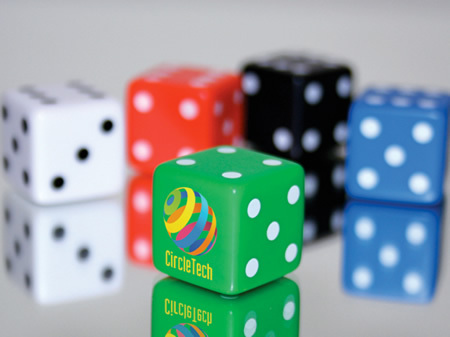 This high-quality, value-priced Custom Plastic Dice are great for tradeshows, giveaways, promotions, and much more. Value Line Customized Dice are our most economical dice product, with pricing as low as $0.67 per die. Our minimum order for these low-priced custom dice is 750 pieces. These promotional dice feature smooth edges and a translucent casino look. They are available in 5/8", 3/4", and jumbo 1" sizes, with or without standard spots. You can print one to six sides with the custom design(s) of your choice. The minimum order is 250 pair for 1" dice and 500 pair for 3/4" and 5/8" dice. Production time for Custom Transparent Dice is about two weeks after proof approval. Add a unique twist to your dice promotion with our Custom Printed Loaded Dice. These 3/4" Plastic Dice are available in black, white, red, or green, with the one- to full-color design of your choice on the one/top side of the dice. The minimum order is 100 pair. Poly-bagging is also available. Production time for Custom Loaded Dice is about two weeks after proof approval. Loaded Dice Pricing – Includes Your 1 to Full Color Design on the "One" Side! Our Opaque Custom Dice are available in 5/8", 3/4", and jumbo 1" sizes. White, red, blue, black, and green Custom Dice are available. 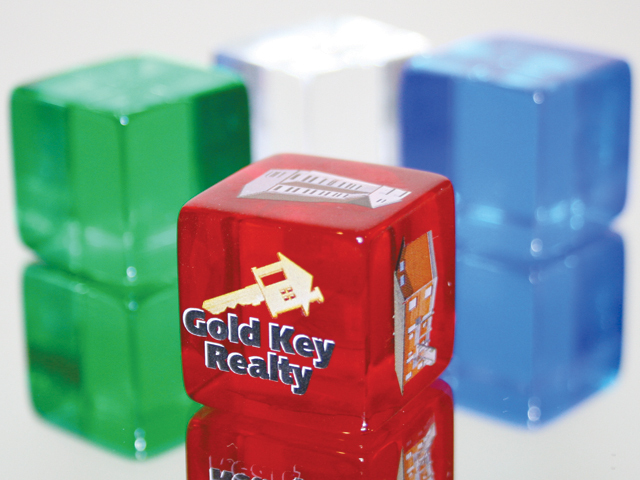 These Promotional Dice are customized with your custom one- to full-color design(s) on one to six sides of the dice. The minimum order is 250 pair for 1" dice and 500 pair for 3/4" and 5/8" dice. Poly-bagging is available for these Custom Promotional Dice. Production time for our Customized Promotional Dice is about three weeks after proof approval. 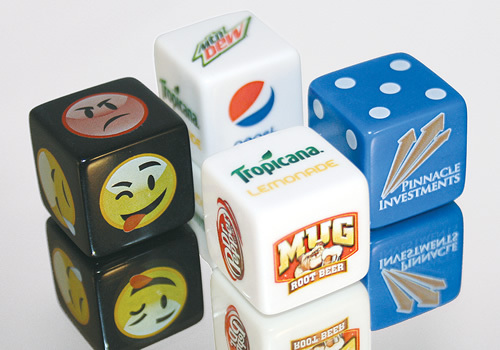 For quotes or additional information on Custom Promotional Dice, please contact us at 1-800-233-0828. Or, get a copy of our FREE 96 Page Casino Supplies Catalog.